When purchasing a Robart Pinchless Arched Port Walking Horse Bit from us you can rest assured that you will be getting an exceptional quality Walking Horse Bit which will be made to last. This Robart Pinchless Arched Port Walking Horse Bit we have to offer uses pressure instead of pain to train. Picking up on the shanks lowers the bit into the mouth as the bit is pushed forward. 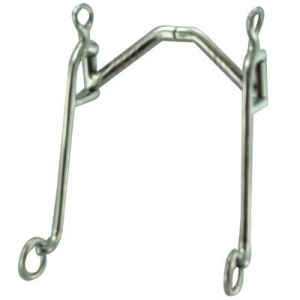 This Pinchless Horse Bit has 8'' shanks and is made of top quality materials made to last a lifetime. When buying a Walking Horse Bit from us you can rest assured that the product you are purchasing is made to last.